After 10 years of ownership, George Weber Chevrolet said this week it will soon close its Waterloo dealership and consolidate local operations into the recently renovated Columbia location. 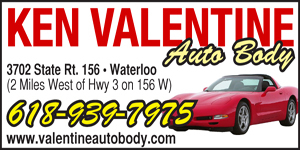 Some of the 22 employees at the Waterloo dealership, located off Route 3 at the north end of town, will be transferred within the company, Weber said. The building itself won’t be vacant for very long. Quality Collision plans to open a new location there by February 2014. The commercial property located at 835 North Market Street in Waterloo was sold at auction on Wednesday, and plans are for it to become a locally owned restaurant in the near future. The last business to be located there was Celebration Station. Prior to that, it had been used as a daycare center, church and restaurant. To read more on these stories and to get your weekly local business news, pick up a copy of the weekly paper — on stands Wednesday. Or subscribe online today!